Poulan is a brand owned by Swedish manufacturer Husqvarna. Husqvarna used to be a part of Electrolux before becoming its own company in 2006. Poulan now sits as its own brand, with Husqvarna as its manufacturer. However, it never used to be just a brand, it was an independent American company from Louisiana up until the mid 1950s. Started by Claude Poulan in 1912, it produced high quality chainsaws before being purchased by the Beaird Company. It was then owned by Emerson Electric up until the mid 1980s when Electrolux purchased it. It’s also very well known for its 306a chainsaw model which was used in The Texas Chain Saw Massacre movie. Chainsaws produced by Poulan are popular in their own right. However, they do tend to share technology with Husqvarna which further enhances their market share as quality saws. Poulan produce several different models of chainsaws. These include pole saws – both petrol and battery as well as commercial grade, homeowner and professional chainsaws. Whatever the market requires, Poulan products deliver. It produces 70% less emissions. It has 20% lower fuel consumption. It has a good pull start system which makes it easier to start. It has a choke/stop control system to reduce engine flooding. The bar oil is known to leak. The chain can be hard to replace. It’s quite a heavy saw. Black and Decker battery powered chainsaw. Poulan Pro gas powered chainsaw. Dimensions: 11.8 x 16 x 12 inches. QWhat fuel mix does this chainsaw require? A50:1 mix of synthetic 2-cycle oil with 1 gallon of gasoline. QDoes it automatically oil the chain? QDoes it come with a case? QWhat jobs can this saw do? AMost small-to large cutting jobs. Almost considered commercial grade or professional, this affordable chainsaw meets the mark in terms of safety, reliability, and most importantly, power. With the best chainsaw technology available, users can almost be guaranteed they will be comfortable using this saw for their cutting requirements. The beefy engine coupled with the 20 inch bar and chain is all the power you need for any backyard or lifestyle block maintenance. It’s top rated on the market as a saw that can tackle any job, and it’s undoubtedly the best Poulan chainsaw for the money. Check out what other people who purchased this product think about it. Read Poulan Pro 967061501 gas chainsaw reviews. It has a powerful 42cc 2-cycle engine. The effortless pull start system makes starting it easy. It comes with plenty of accessories as part of the deal. Some of the parts are not well made and break. People find it difficult to keep it idling. Dimensions: 11.75 x 11 x 38 inches. QWhat is the fluid ratio? QWhat sharpening file is needed for the chain? 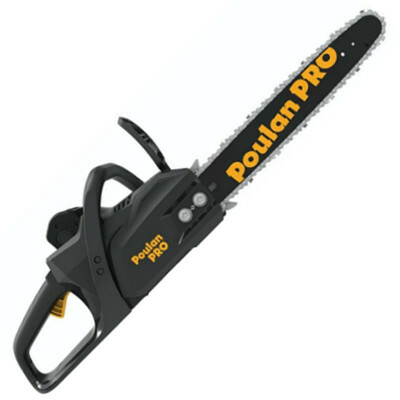 When it comes to power, this Poulan Pro gas powered chainsaw has it in the bag. It’s a top rated saw in terms of the power transferred to the tree for cutting, but not so much in reliability. Many users note that it can be hard to start, and sometimes hard to keep going. For around the home this wouldn’t be too much of a problem with light maintenance, but it may not be suitable for out in the field. However, reliability aside, this 18 inch powerhouse comes packed full of safety features and even comes with a range of accessories as standard. This generally doesn’t happen with other manufacturers or brands. Check out what other people who purchased this product think about it. Read Poulan Pro PP4218A gas chainsaw reviews. It has an anti-vibration system to reduce user fatigue. Its pull start system makes it easier to start. Some of the parts don’t seem to fit together well internally. It’s known to stop going and be difficult to start up. The pull start may need adjusted before use to make it easier to start. Dimensions: 22.3 x 15.8 x 20 inches. QWhat size file is needed for chain sharpening? QWhat fluid ratio should be used? AMix 87 octane or higher 40:1. QWhat oil should be used in this saw? ASynthetic 2 stroke motor oil. This saw fulfills all expectations of being a saw that handles commercial grade saw pressure. It cuts well and delivers on its promise to get that winter wood pile stocked up. From those points alone it’s clear to see this is the best Poulan chainsaw for the money. However, in reliability and ease of maintenance, this saw lets some users down. Some users say this saw can be difficult to start – and keep going. Once you have those problems fine tuned however, it runs like a dream. Check out what other people who purchased this product think about it. Read Poulan Pro PP5020AV gas chainsaw reviews. For its size, it has a large, powerful engine. It can undertake a range of cutting duties. It’s quite heavy in comparison to other brands of similar specs. It stops working after a short amount of time and can be difficult to start again. Dimensions: 233 x 11.9 x 13.9 inches. QWhat ratio of fluids should be used? A1 gallon of gas and one bottle 40:1 oil. AParts are made in China, some are assembled in the USA. QWhat CC rating is it? For the homeowner who requires a decent hit of power, this saw is the answer. It’s grunty, runs well and overall, is one of the best Poulan chainsaws for the money. It does, however, have problems for some users with reliability, and isn’t top rated because of it. For the cost, you do get a lot of bang for your buck. It’s also one of the more easy-handling models in the Poulan manufactured range. Check out what other people who purchased this product think about it. 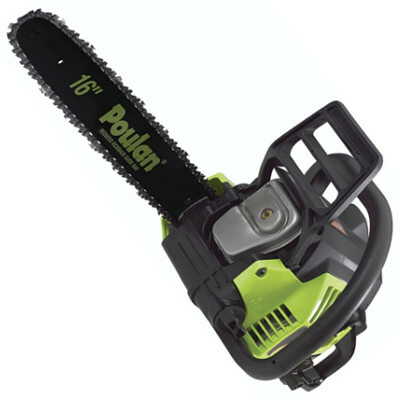 Read Poulan P3816 gas chainsaw reviews. It has a powerful 38cc 2-cycle engine. Its anti-vibration system helps reduce user fatigue. It has an effortless pull start system to help make it easier to start. It needs a higher idle point so it doesn’t stop. It uses a lot of oil. The chain comes loose easily. Dimensions: 33 x 11.9 x 13.9 inches. QDoes it have a top handle or rear handle? QWhat does the CC rating convert to in horsepower? 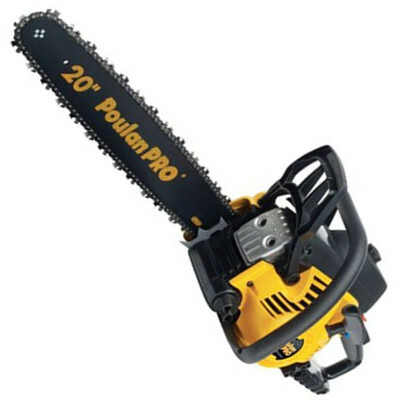 For the price of this Poulan gas powered chainsaw, you certainly get your money’s worth. It’s a powerful chainsaw that gets any home maintenance completed with ease. It also offers great safety features and has cost effective replacement parts as well. Overall, this is one of the best Poulan chainsaws for the money. Check out what other people who purchased this product think about it. 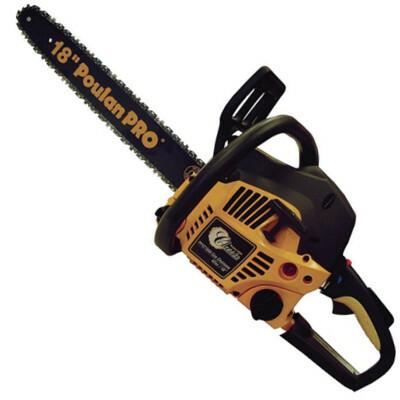 Read Poulan Pro PP3816A gas chainsaw reviews. It can cut trees up to 6 inches in diameter. Its brushless motor helps in extended run times. The battery and charger have a two year warranty. The battery is interchangeable with other Poulan products. It’s quite a heavy chainsaw for being battery powered. It’s limited in where it can be used due to needing a power source to charge the battery. Some of the parts aren’t well assembled. Poulan Pro battery powered chainsaw. Dimensions: 8.75 x 9 x 30 inches. QDoes it come with a battery and charger? QWhat kind of battery is it? QWhat voltage is the battery? This Poulan battery powered chainsaw offers homeowners a stress-free experience. Not only does it start with the push of a button, but it also requires minimal maintenance and no mucking around with mixing oils and fluids. It also runs quietly and can take on the majority of homeowner cutting tasks with ease. It runs well, and is a great alternative to petrol powered chainsaws. Overall, this is one of the best Poulan chainsaws for the money when it comes to providing a gas-free option. Check out what other people who purchased this product think about it. Read Poulan Pro 967044101 cordless electric chainsaw reviews. It’s a unique looking saw, different from others which makes it stand out. It’s a good homeowner’s saw for light maintenance. It has a very powerful 40cc engine. It has good fuel consumption. The bars and chains aren’t very well made according to some users. Some factory components might need adjusted before use. Poulan Wild Thing gas powered chainsaw. Dimensions: 11.9 x 14.8 x 35.2 inches. QWhat is the chain pitch for sharpening? Many customers have positioned this gas powered chainsaw as a mid-range chainsaw on the market. For the cost, you do get a genuinely powerful machine but it’s one that has its drawbacks. It would take someone who knows what they are doing to maintain it well as it requires disassembly from time to time. It also only comes with a one year warranty which can mean that any repairs needing undertaken at cost to the manufacturer need to be completed in that timeframe. Check out what other people who purchased this product think about it. Read Poulan P4018WT Wild Thing gas chainsaw reviews. The anti-vibration system works well at reducing fatigue. It has an inertia-activated chain brake. It comes with a carry case when most other manufacturers and brands don’t. It’s powerful with its 42cc 2-cycle gas engine. The chain is known to fall off easily. Dimensions: 11.9 x 13.9 x 34.8 inches. QWhat CC is the engine? Most users of this Poulan gas powered chainsaw are finding it to be an extremely reliable and hardy machine. It powers through tough logs and for the cost, is the best deal in terms of what you get. The only negative is how long it can take to start from cold. However, once you’ve got it going, you’ll never want to put it down! It has a powerful 42cc engine and is suitable for small to large jobs. Overall, it’s one of the best Poulan chainsaws for the money. Check out what other people who purchased this product think about it. 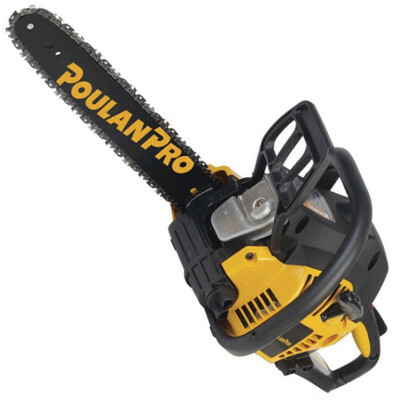 Read Poulan Pro PP4218AVX gas chainsaw reviews. The Poulan chainsaw carry case is the perfect accompaniment to your Poulan chainsaw. It can be difficult to transport chainsaws without putting yourself and others at risk. If the chain isn’t covered you can run the risk of cutting yourself when you move it. However, with a Poulan hard plastic chainsaw case, you can keep your machine from getting broken or weathered as well as keeping people safe. It works by lessening daily wear and tear, as well as protecting it from the outside elements when not in use. If you are looking specifically for Poulan case, check out this comprehensive guide about available Poulan chainsaw cases. However, if you’re looking for a case in general regardless of the brand, you would love to read this full buying guide on how to select the best chainsaw case for the money including reviews & comparison. If you are looking specifically for Poulan boots, check out this comprehensive guide about available Poulan chainsaw boots. However, if you’re looking for boots in general regardless of the brand, you would love to read this full buying guide on how to select the best chainsaw boots for the money including reviews & comparison. When the time comes to replace your worn or damaged Poulan chainsaw bar, you can rely on Poulan to provide you with a quality replacement. Poulan produce 8 inch, 14 inch, 16 inch, 18 inch and 20 inch replacement bars. All Poulan replacement guide bars have reduced kickback, a small radius nose and slim symmetrical contour. This enables them to be lightweight and maneuverable for a more comfortable operation of your chainsaw. If you are looking specifically for Poulan bar, check out this comprehensive guide about available Poulan chainsaw bars. However, if you’re looking for a bar in general regardless of the brand, you would love to read this full buying guide on how to select the best chainsaw bar for the money including reviews & comparison. Every owner and operator of a Poulan chainsaw will, at some stage, require a new chain. This can be caused by the old one breaking, becoming damaged, or being worn down below 4mm from sharpening. It can be expensive to purchase new chains, but not with Poulan. They are dedicated to producing high quality, cost effective chains that stand the test of time. They produce chains in 8 inch, 14 inch, 16 inch, 18 inch and 20 inch sizing. All chains are durable and weather resistant as well. They are also excellent for delivering precise cutting with reduced kickback as they are heat treated and hard-chromed. If you are looking specifically for Poulan chain, check out this comprehensive guide about available Poulan chainsaw chains. However, if you’re looking for a chain in general regardless of the brand, you would love to read this full buying guide on how to select the best chainsaw chain for the money including reviews & comparison. In order for your Poulan chainsaw to run at its best, you need to purchase Poulan chainsaw oil. Poulan offer Poulan brand pre-mixed 2-stroke fuel & oil. This oil is designed for 2-stroke air-cooled engines requiring a 40:1 fuel and oil mixture. It’s ethanol free, high octane fuel which stays fresh for years. This enables you to store it for a long period of time without the worry of it no longer being effective. This specially formulated product is designed to make your chainsaw run at premium levels of efficiency for longer. If you are looking specifically for Poulan oil, check out this comprehensive guide about available Poulan chainsaw oil. However, if you’re looking for an oil in general regardless of the brand, you would love to read this full buying guide on how to select the best chainsaw oil for the money including reviews & comparison. Poulan is a brand owned by Swedish manufacturer Husqvarna. Where are Poulan chainsaws made? Parts are made in China, and some are assembled in the United States. 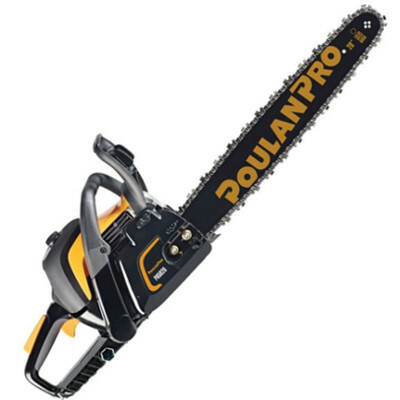 Where do you buy Poulan chainsaws? You can buy Poulan chainsaws online on websites such as Amazon, as well as in many leading hardware stores such as Home Depot.